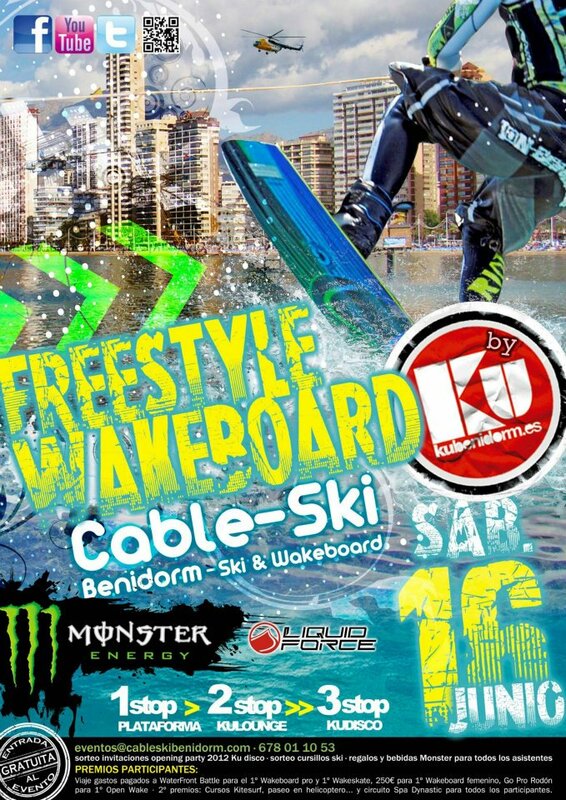 On 16 June the 1st Freestyle Wakeboard by Ku Benidorm at Cable Ski, will be held, a championship with local / regional participants amongst which there are national & European wakeboard champions the latest trend in water skiing. Energy Monster is committed to Cable Ski opening the selection for the 2012 European Tour Waterfront Battle to where winners of Wake and Wakeskate will travel with expenses paid as a reward. Tournament prizes include, a helicopter ride, gifts from Liquid Force, Sugar Shop, Kite Surf courses, Go Pro Camera from Photos Rodon, bikinis from Sugar Shop and for all a SPA circuit at the Dynastic. A free entry event with thrilling jumps and spectacular tricks Freestyle. For this Monster Energy will liven up the day with a Hammer on the beach, drinks, music and Ku gifts, Liquid Force and Monster for all. Etrance tickets will also be raffled for the Opening Party 2012 Disco Ku and skiing courses. The day of qualifying rounds will start at 08:30 and athletes may participate in the category Wakeboard Pro Wake Open, Open Wakeskate and Open Wake female. From 13:00, and with the results of classification, the cable will resume its normal activity, but will continue the party with Monster Energy, music, drinks and gifts to closing. At 21:30 athletes have an appointment at KU Lounge, where they will receive their prizes.